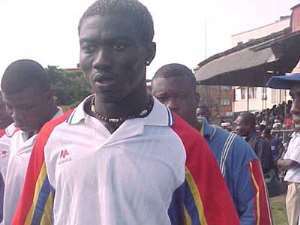 …and asks for divine intervention Hearts of Oak's striking prodigy, Benard Don Bortey has pleaded with the numerous supporters of the club and the entire Ghanaians to forgive him for the role he played in the elimination of the team from the CAF champions league. In an exclusive telephone interview with SPACE FM this morning, courtesy Peace Fm's Kofi Asare Brako, the Serial Killer, as he is affectionately known in the Ghanaian soccer fraternity, was short of words and broke down tears in an attempt to explain why he missed the fourth kick during penalty shoot-out in the 1/8th stage champions league tie with Etoile du Sahel which the Phobians lost 5-4. When he finally forced out few words, he said he was down-spirited before effecting the kick. “I cannot explain why I missed the kick. I have been down spirited in recent times, I just cannot understand what is happening to me, and really need divine intervention. This is not how I play football”, he told Kwabena Kyere Stugard, the host of SPACE Supersport. He called on all supporters to remain calm and resolute in the face of all difficulties as the team re-launches the campaign to win the domestic league and the Confederation Cup.